More Nice Pens! Cp8, Orpheo Gold Dust, Aurora, Bexley, Stipula, Pelikan And More! I'm culling a good chunk from my collection this spring. 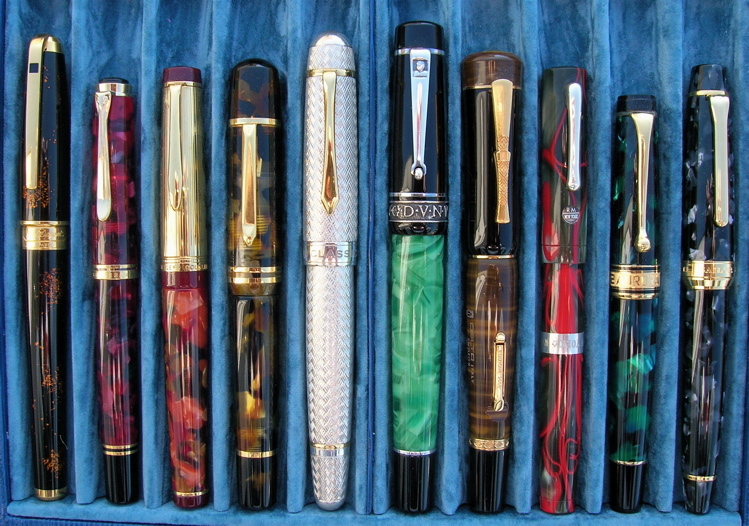 Here are some more nice pens. There are some really nice nibs in here too. 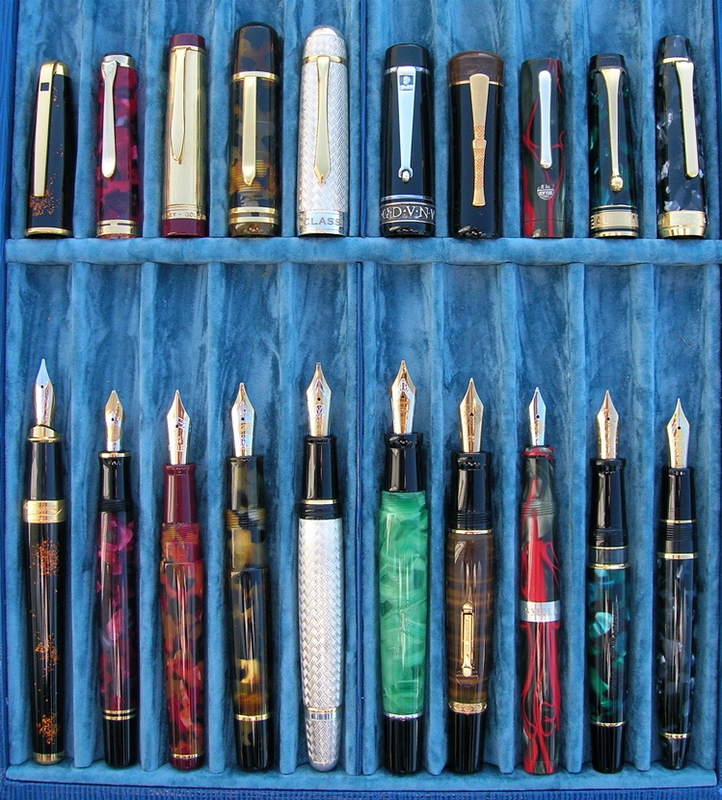 All pens have been used but are in excellent+ to NM condition, and all have box and papers unless otherwise noted. First email gets them, payment by Paypal or MO. Prices include insured USPS Priority Mail anywhere in the US. Overseas shipping at cost. Feel free to email with any inquiries. Sorry as always for the lousy pictures. 1. ST Dupont Olympio, Gold Dust, 18K M nib, c/c filler- Beautiful gold dust and Chinese lacquered Olympio in the largest size. Smooth medium nib. Some fine marks on the clip, pretty typical for the Orpheo/Olympio. Has been some time since these were made. $695 shipped. 2. Pelikan M620, Madrid, 18K OBB nib, piston filler- Early series from the M620, beautiful red with grey marble. Smooth broad OBB point, have some other point sizes if that's a problem. $350 shipped. 3. Bexley Gold Line, Terra Cotta, 14K M nib, c/c filler- Very nice Bexley in terra cotta acrylic with vermeil cap and trim. Smooth and soft old style Bexley 14k medium nib. Beautiful Pen. No box or papers. $350 shipped. 4. Bexley Poseidon Grande, Tortoise, 18K Stub nib, c/c filler- Larger sized Poseidon, in what I think is a non production color. Crisp stub nib. No Box or Papers on this one. $350 shipped. 5. Classic Pens CP8 LE, Vannerie, 18K Stub nib, c/c filler- Really nice CP8 in the Vannerie or basketweave pattern. Gold plated trim. Very nice stub nib- super smooth, super soft. Just a beauty to look at and use. $725 shipped. 6. Delta Lugdunum, Green, 18K B nib, c/c filler- Big, beautiful Delta. Green acrylic, sterling trim. Great color. Can be filled using an eyedropper. #519 of 998. The broad nib has a nice chisel tip, and is a great writer. $425 shipped. 7. Delta Indios LE, 18 K M nib, lever filler- Nice big Delta LE. Very attractive pen, smooth writer. $395 shipped. 8. Stipula Rebecca Moss LE, Green/Red, 18K M nib, c/c filler- Another Stipula LE, this one made for Rebecca Moss. It's in the style of the Barracca LE, in green acrylic with red swirls and sterling trim. Roughly Pelikan M600 sized. The M nib is smooth and has nice ink flow. It's quite broad for a medium. This one is #8 of 100. No Box or Papers for this one. $400 shipped. 9. Aurora Optima, Green, 18K OF nib, piston filler- Beautiful green Auroloide with a nice writing Aurora oblique fine point nib. Beautiful pen, beautiful writer. $350 shipped. The Bexley Goldline is on hold pending payment. Thanks! The Goldline has sold! Thanks! What a great selection. The Aurora is so tempting. The Sailor PG #10 is on hold pending payment. Thanks for looking! And the Sailor has officially sold. Thanks! The Pelikan Madrid, #2, is on hold pending payment. The Pelikan Madrid has sold. Thanks! 10. Sailor Professional Gear, Grey Mosaic, 21K M nib, c/c filler- Sold! #5. The CP8 is #41 of 250 pieces. #6. The Delta Lugdunum comes with the original box which does include a bottle of ink and an eyedropper for filling. The Bexley Poseidon, #4, has been claimed! The Optima is going for a good price! The nib is not my cup of tea though. I hope the sale goes well Doug! The Classic Pens CP8 is on hold pending payment.